Huge Savings! 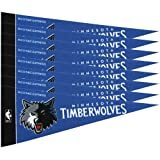 Up to 14% off on Outdoor Pennants at Basket Express. Top brands include Detroit Athletic Co, Rico Industries-Tag Express, Rico, Zipperstop, & WinCraft. Hurry! Limited time offers. Offers valid only while supplies last. 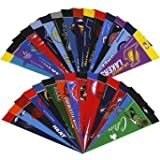 Zipperstop 8 Pack Officially Licensed NBA Knicks Mini Pennants, 4" x 9"
Zipperstop 8 Pack Officially Licensed NBA Celtics Mini Pennant, 4" x 9"
Zipperstop 8 Pack Officially Licensed NBA Wizards Mini Pennants, 4" x 9"
Zipperstop 8 Pack Officially Licensed NBA Cavaliers Mini Pennants, 4" x 9"
San Antonio Spurs NBA Hardwood Collection Premium Pennant 12" X 30"